Next post: Next stop: Reykjavik, Iceland. Welcome back, thanks to those who have been reading the other posts on my blog! Its nice to see a steady stream of readers. 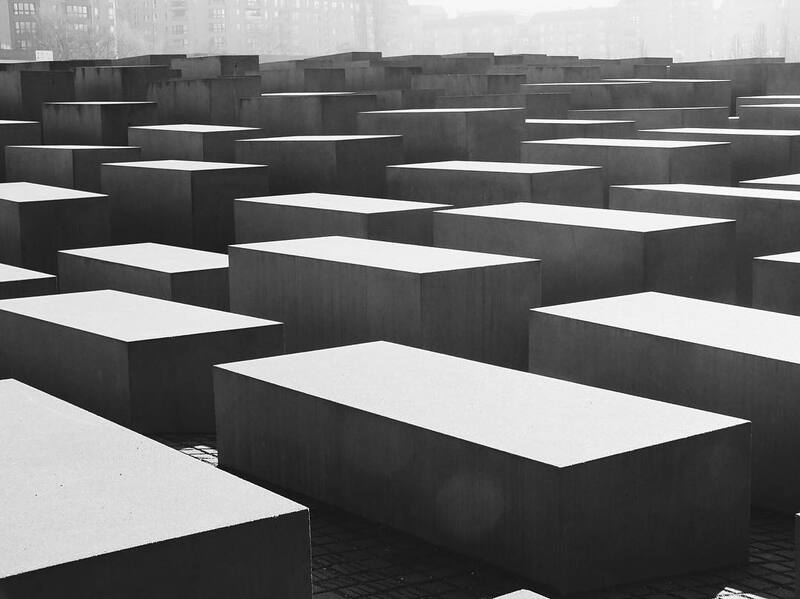 Here I have a very simple post about my weekend in Berlin. For those who didn’t know I took a weekend earlier this month, 12th Feb-15th Feb, to spend some time with some friends – Miriam, Grace and Jess. Somewhat becoming a tradition amongst our group of friends but Valentines Weekend has proven to be the perfect time to get away for a break of every day life. 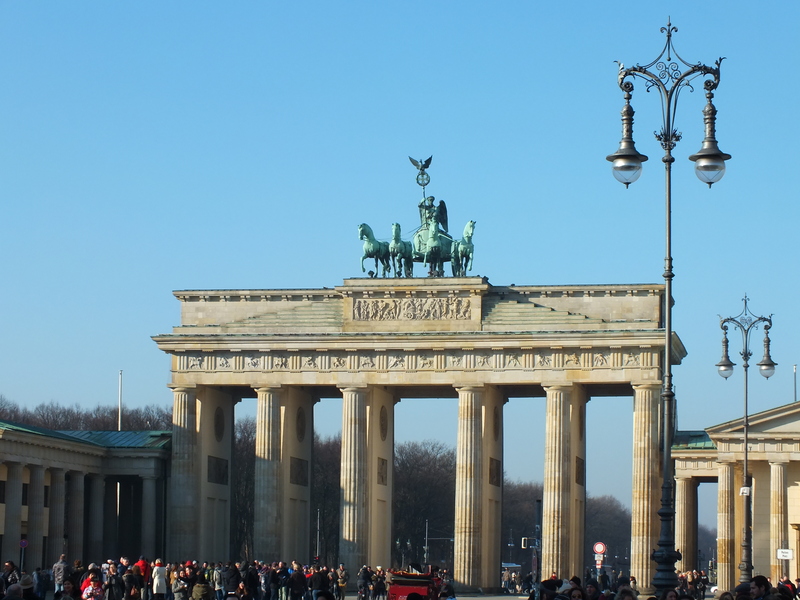 So without further ado here is some of the places that we visited and things we done in A Weekend in Berlin. Grace, the wonderful human being she is, had took the initiative and booked us all onto a walking tour of Berlin. This happened to be a personal highlight of the weekend with the tour starting early in the day and last around 2-3 hours long. A little fact for you on this day I walked 14.79 kilometres. The tour itself covered a range of places – listed below – the tour was led by Rochale who did a fantastic job at explaining the places and its history. 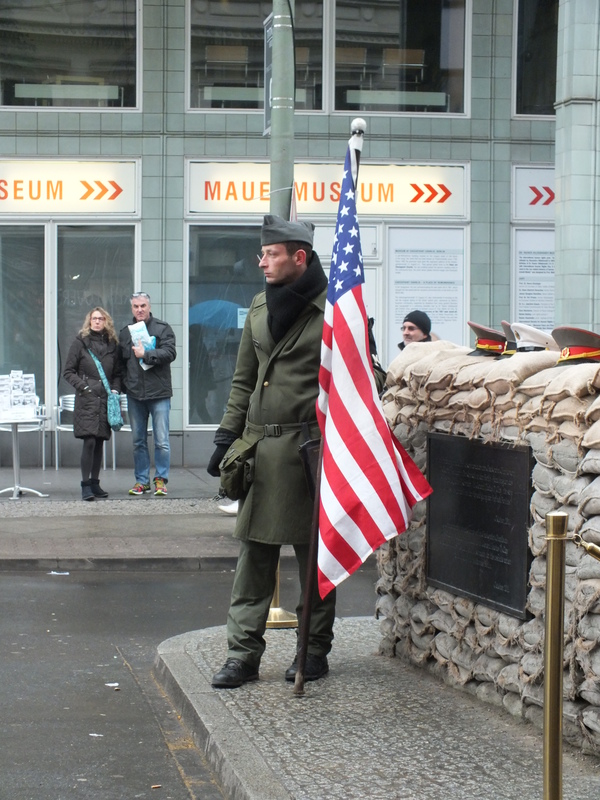 Not only that, she gave a presentation of 8 minutes on the past 800 years of Berlin history. (ended up being 9 minutes but still extremely impressive). We were also lucky enough to visit the Gendarmenmarkt during the installation of renowned artist Ai WeiWei’s latest exhibition of 14,000 life jackets to represent the refugees trying to flee war and hardship. 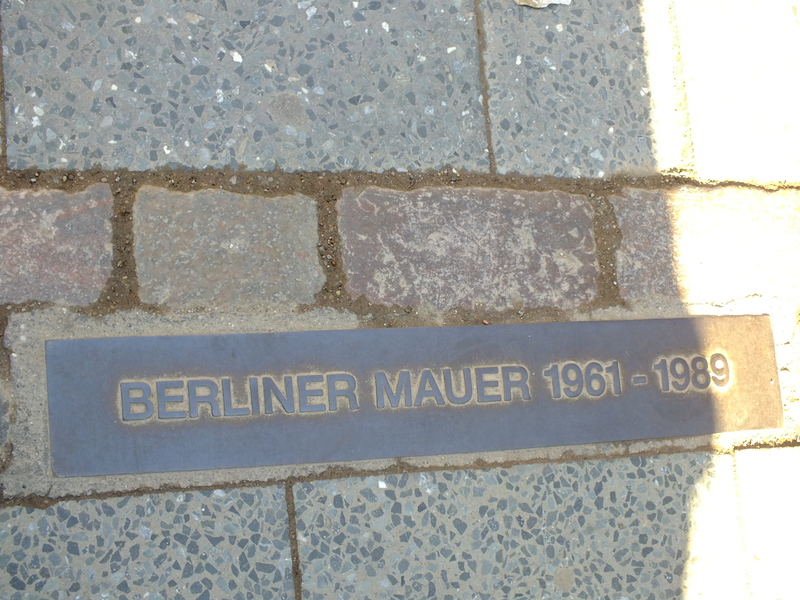 The Berlin Wall is represented by a set of two bricks in the place of where it once stood. 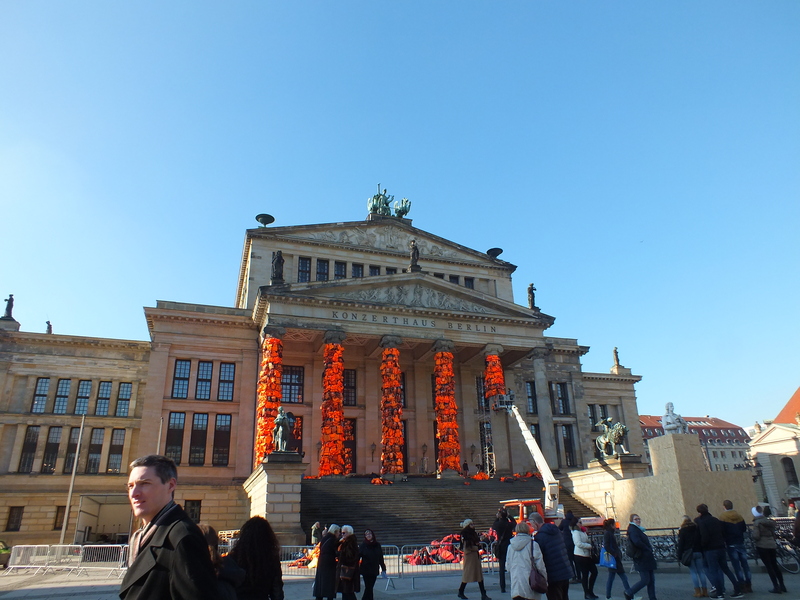 The Gendarmenmarkt covered in Life Jackets for renowned artist Ai Weiwei’s latest exhibit. Visiting the DDR Museum was also another nice activity that I did with Jess, whilst Miriam and Grace disappeared into the depths of Berlin’s Techno-vibe. This museum has to be one of the most interactive museums I’ve visited. Each part has little cabinets you can open showing what life was like in East Germany (1949 – 1990). A few show rooms, an old Trabant car also known as a Trabi, a prison cell and more. I took the opportunity to play a little bit of a Facebook prank on friends back home when taking a quick photograph. I had only updated one post on Facebook saying I was leaving on the Friday morning then hadn’t posted until Sunday. Leaving it the perfect opportunity to have a laugh. Posting, the photograph below, I led people to believe a horrible mistake had been made with my accommodation booking and just left it at that. Then the replies came in with a couple knowing exactly what it was and others being shocked and confused. A GDR (German Democratic Republic) Prison Cell used by the Stasi. We ate at a couple of places whilst away but as soon as we arrived we were told that we would love this place. So what’s special about Burgermeister? Well I think the fact that this is a burger joint that is made from an old public toilet block. Only a short distance away from the East Side Gallery it was a perfect place to get a bite to eat. East Side Gallery – Art on the Wall. So like I said just around the corner or over Oberbaum Bridge which in itself is quite scenic. Probably something everyone has heard about before and without a doubt a nice thing to do. There are some bloody brilliant artists out there in this world of hours and some great pieces of history along this wall. We did this walk up and down the wall on the last day of the trip in the morning and felt like a good way to end the trip.